Invisirail is an amazing railing compliment for spaces of any size. While they add to the beauty and elegance of a large space, they also have the ability to make a small space seem larger than it actually is. This is possible due to its transparent nature. If you have a less than average sized backyard, you may want to try using the Invisirail 38.5″ x 57.812″ Glass Railing Panel (10mm) to do something amazing in your backyard. Another great idea is using the Invisirail 38.5″ x 57.812″ Glass Railing Panel (10mm) for great stair glass railings. They are preferred by interior designers when elegance is a top requirement. The stair glass railings can be customized. It is a popular school of thought that stair glass railings are limited when it comes to appearance. However, that is only a myth! Your imagination is the limit! 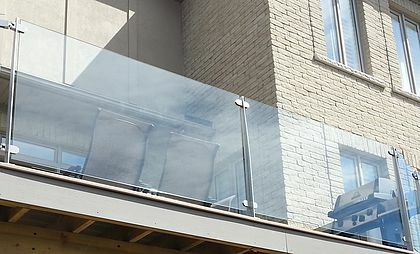 Inivisirail glass railings are very easy to maintain as they do not require frequent repairs. While it is true that some other railing materials may cost less than glass railings upon purchase, they still cost more in the long run as they would most probably need replacement much sooner than stair glass railings would need touch ups. Glass railing systems can also increase the value of your home or any piece of real estate you intend to put on the market. Get the Invisirail 38.5″ x 57.812″ Glass Railing Panel (10mm) today! We are certain it will be a great addition to your home or deck. Don’t wait; get the value and beauty you deserve today! 38.5″ x 57.812″ Glass Size.